It happened again. Home from the store, I unwrap the Prosciutto di Palma, carefully layered between the wax paper. My worst nightmare. When cut correctly, Prosciutto di Palma (or it’s cousin Prosciutto di San Daniele) is a food of wonder. The cured meat is intense yet tender, the soft white almost translucent lardo just melts on your tongue. In the summer, prosciutto can be artfully draped over slices of ripe and juicy melon, the salt of the prosciutto perfectly sets off the sweetness of the melon. In the fall we’ll eat it with plump figs. This week I had a generous antipasto plate in mind. But curses! The prosciutto has been sliced too thick. Again. There’s no fear of tearing as I remove these monster slices from the interleaving paper. Thickly-sliced prosciutto is disgusting. Imagine chewing a dense yet flabby piece of old shoe leather. Exactly. If you have your own prosciutto nightmare, then don’t despair. There’s a silver lining to this tragedy. PROSCIUTTO CRISPS! 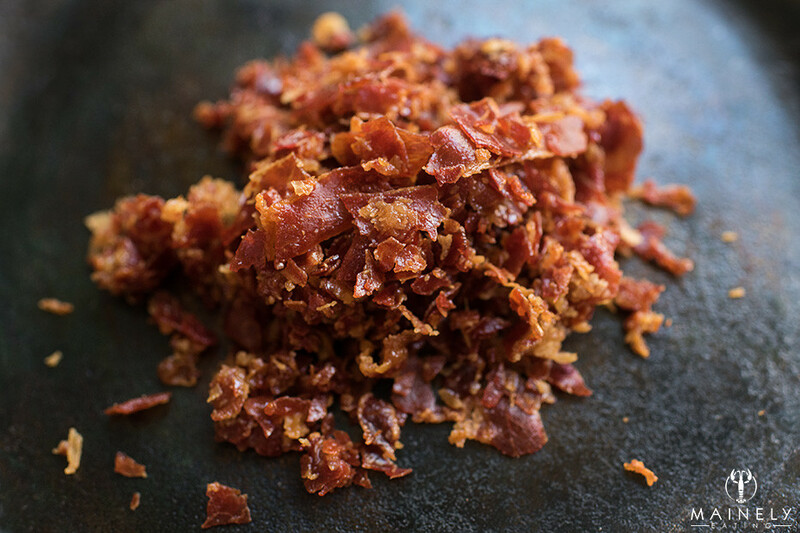 Unlike the bacon bits you may have encountered at a salad bar that are actually artificially flavored textured soy masquerading as bacon, this is the real deal. 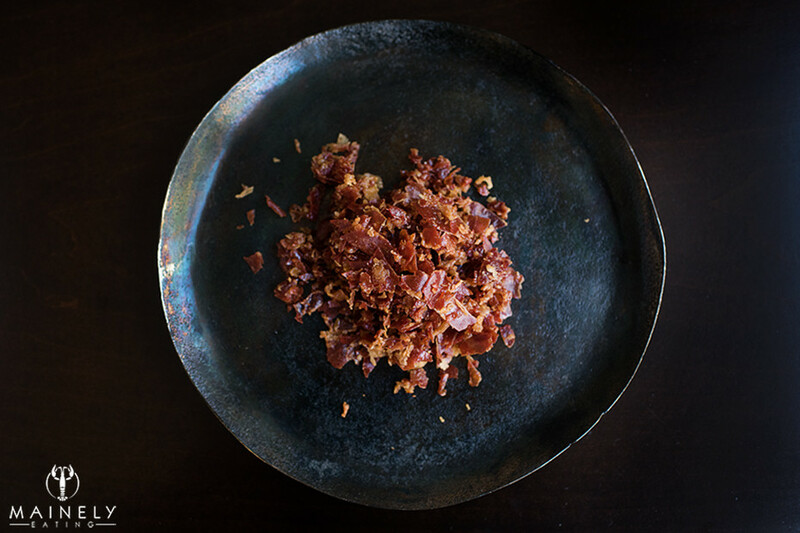 A few minutes in the oven transforms the too-thick prosciutto into savory crisps that can be lightly crushed into intensely flavored prosciutto shards or more vigorously into prosciutto dust. If you can resist the temptation to eat the crisps directly from the baking tray, they’ll transform salads, eggs, pasta, heck, pretty much anything and everything. For easier clean up, line a rimmed baking tray with aluminum foil and then a piece of parchment paper. Make sure your tray has a rim otherwise the fat will end up all over your oven and burn. Remove and turn oven (be careful, they’ll be hot! ), a fish slice works well. Bake for another 5-8 minutes until the fat is a deep golden brown and the prosciutto is just starting to smoke. Eat or crumble into shards or dust. The crisps or dust can be kept in the fridge for a few days. If they lose their crispness, a few minutes in a hot oven will dry them out again. They’ll shrink pretty rapidly, a quick turn halfway through cooking will ensure maximum crispness. The parchment paper removes the risk of sticking and the aluminum foil makes clean up a cinch. I dare you not to lick your fingers clean after crumbling the prosciutto crisps. 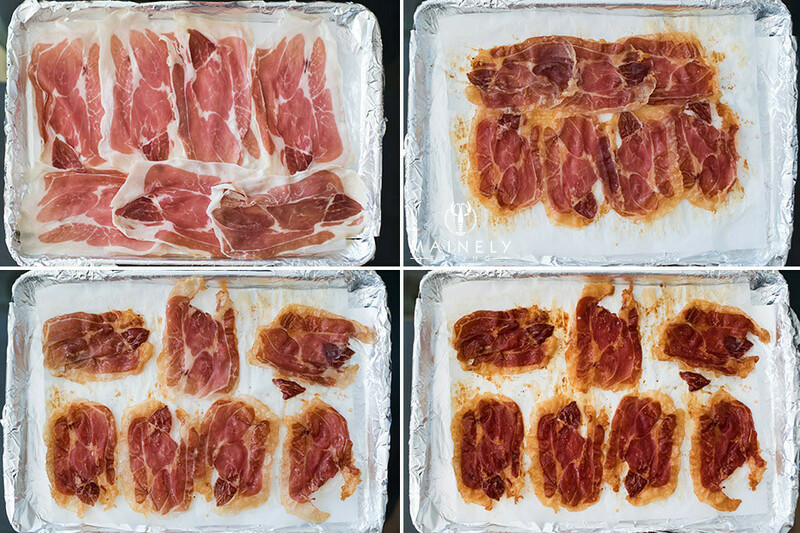 When the prosciutto looks like this, you’ll want to pull it from the oven. See the little hint of smoke starting in the top right corner? Pasta = good. 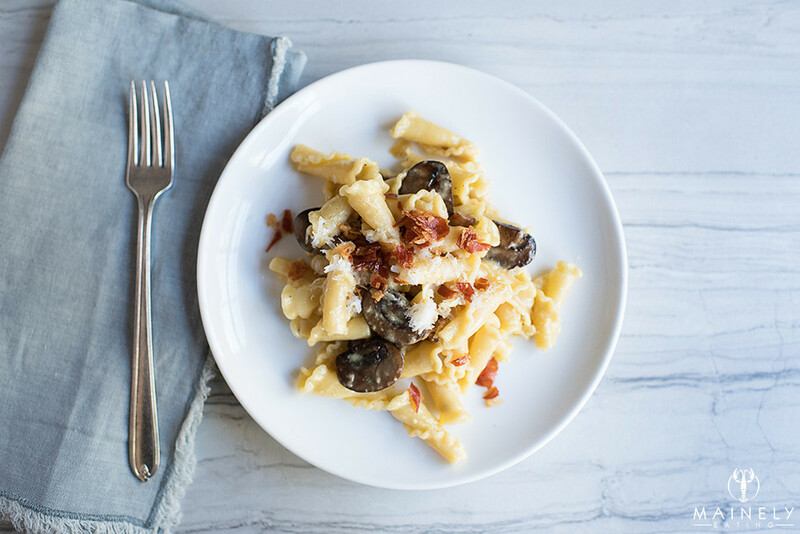 Pasta with prosciutto crisps crumbled over the top = better. 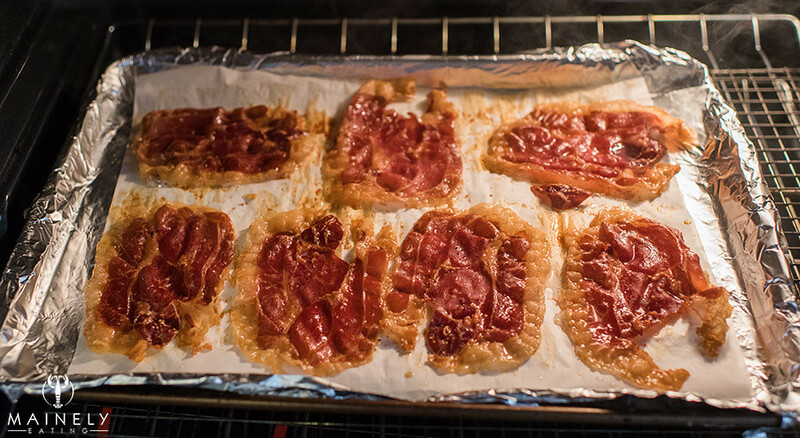 This entry was posted in Entertaining and tagged Baked Prosciutto Crisps, Low carb prosciutto chips by Mainely Eating. Bookmark the permalink.